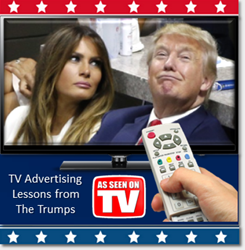 Whether Republican or Democrat, Trump supporter or critic, Scott Kowalchek of DirectAvenue says TV advertisers in all industries can learn a few lessons from both the stumbles and strides Donald and Melania Trump have demonstrated on the campaign trail. Lessons on driving engagement, brand protection, and audience research came into sharp focus at the Republican National Convention. 1 – Don’t Plagiarize: Whether Melania Trump did so accidentally or intentionally, it appears that during her speech on the first night of the GOP convention she was inspired by (or “stole” depending on your point of view) parts of a Michelle Obama speech from 2008. How does this relate to TV advertising? While it's reasonable to be envious and try to copy the success of the “Got Milk”, “Where’s the Beef?” or another iconic, memorable TV commercial, advertisers must take steps to not copy their copy. They should hire a creative team and writer for their TV commercial that has the reputation of developing engaging and unique scripts and visuals that command the attention of viewers. Production partners under consideration must deliver the “WOW factor”. Their creative genius must make the hair on the back of the neck stand up; it must inspire, it must make advertisers laugh or even cry. They must also give references so advertisers can ensure that the most impressive commercials in their portfolio were produced exclusively by them with no involvement from any other creative agency. Their body of work must stand out from any other company under consideration. Melania Trump can fire her speech writer. TV advertisers, by contrast, must hire a creative team that does not borrow (or steal) someone else’s genius. 2 – Be Bold with Brand: Besides Melania Trump’s speech, the most memorable event at the convention was Donald Trump’s mist-shrouded, black silhouette as he took the stage to introduce his wife to convention attendees. Observers compared the moment to a WWE-style introduction to a wrestling match. Both his critics and fans agree Trump’s audacious style has separated him from other Republican and even Democratic presidential candidates. What can advertisers learn from Trump’s loud, audacious style? Don’t be afraid to deliver a bold, even brash message and CTA in a TV ad campaign, even if it’s controversial. Too many companies try to be “mainstream” by creating slogans and launching TV ad campaigns that are deliberately inoffensive to everyone. The result is often a bland campaign. They’re so concerned about “PC” (political correctness), they choose to make the most conservative creative decisions in promoting their brand. While many veterans of TV advertising scoffed at the quirky, arguably tasteless “Dollar Shave Club” commercials when the company launched three years ago, there was certainly less scoffing when it was sold to Unilever for more than $1 Billion. Advertising and TV brand experts agree it’s better to be memorable, even if some customers are lost in the process, as long as advertisers don’t lose the core customers who love their brand the most. If a bold, attention-grabbing DRTV ad campaign resonates with an advertisers most valuable customers, it’s more likely to succeed than a blander campaign that has less appeal to a broader audience. In Direct Response television, this argument is evident when CPM is compared with ROI. While CPM (cost-per-thousand viewers) is a factor advertisers use to identify the best media, a lower CPM does not always mean a higher ROI. It is not the number of “eyeballs” reached, but rather the number of “responses” that determine success in a direct response TV ad campaign. 3 – KISS (Keep It Simple Smart advertiser) – Trump is a master at delivering short, plain messages. He speaks like he tweets: in short, bite-sized chunks of information. He avoids complex sentences (typically, with the simple sentence structure of “subject-verb-object”) and rearranges each message to end with words that will have the biggest impact. Besides the character limits of various social platforms, being brief is key to success for brands in today’s short-attention-span world (Attention spans dropped over 50% in the past decade). With so many devices and channels competing for eyeballs these days, the only way to stand out is to be succinct. By coincidence (or is it? ), succinct, (short form TV buying) messages are driving the most successful DRTV campaigns. Because direct response marketers are pushing products into retail outlets more quickly than they did a few years ago, advertisers are buying shorter spots aimed to drive prospective customers to retailers. While long-form DRTV campaigns remain an effective way to increase brand awareness, they’re mainly available in late night or early morning hours when fewer people see them, generating a smaller ROI compared to shorter “Trump-style” spots. While Donald Trump appears to have built his political brand on short, 10 to 15 second sentences, the most successful TV ad campaigns are built on short-form commercials. On a monthly basis, more than 8 billion videos are viewed on Snapchat and Facebook. It’s no surprise then that most TV advertisers allocate between 9% and 12% of their marketing budget on social media while still spending most of their money on TV advertising. A growing number of companies are spending money on social media platforms that amplify their TV brand messages. While pundits can argue whether the next president is the candidate who is the most active on social media, there is no argument that the most successful DRTV campaigns will – by necessity - have an extremely active social media component. A passionate speaker and expert on DRTV trends, Scott Kowalchek is the founder of DirectAvenue, a company that brings brand and direct-response advertising together under one roof and provides clients with national exposure through a lower-cost direct-response buying model. Kowalchek began his advertising career with ICG (Carat) working on general market accounts. Scott entered the direct marketing world working for Williams Worldwide TV and started Euro RSCG’s (Havas) short-form division in 1999. His client experience ranges from traditional direct marketing accounts to top-brand corporate accounts. All were looking to achieve a greater ROI. Kowalchek delivered.